Limited to 60 examples to celebrate the 60th anniversary of the original Lotus Seven. Turns out today’s reveal of the new TVR Griffith wasn’t the only driver-focused car to debut at the Goodwood Revival, because Caterham has shown off a new special edition variant of the Seven at the event. Called the SuperSeven Sprint, Caterham describes its new special edition track toy as the “ultimate gentleman’s racer,” featuring racing liveries that hark back to the original Lotus Seven to celebrate its 60th anniversary. It’s powered by a three-cylinder 660-cc engine sending a modest 95 hp to the rear wheels. 0-62 mph takes 6.9 seconds. That may not sound like a lot, but the car is ludicrously light which should make it a hoot to drive. Limited to only 60 examples, the Caterham Seven SuperSprint receives a series of retro-inspired flourishes that hark back to its ancestor. Customers can choose between six vintage racing liveries, each named after a famous track. The Aintree option, for example, is finished in green with an orange noseband, while Hockenheim is silver with a red noseband and Imola is red with a white noseband. There’s also a wooden sports steering wheel, a nod to the original 1960s Lotus Seven, as well as a unique Brooklands windshield, and quilted and stitched seats trimmed in Scottish Innes tanned leather. Leather has also been applied to the handbrake and gear levers. There’s also a limited-slip differential and the suspension has been sharpened with an adjustable race-inspired setup. Caterham can remove the passenger seat to convert the Seven SuperSprint into a single seater akin to vintage to 1960s racers on customer request. “Motorsport and the purist thrill of driving a lightweight race car is in the Caterham Seven’s DNA and are elements that run like a thread through every car we build today, 60 years after the first Seven was made. said Caterham's CEO Graham Macdonald. "As we approach the end of our year of celebration, it makes perfect sense that the car bookending the celebrations is a racer of a similar vein.” “Like the Sprint, this is unquestionably the Seven Caterham would have developed if we had been here in the mid-sixties – and it benefits from being injected with the passion and power of the modern incarnation,” Simon Lambert, Chief Motorsport and Technical Officer, added. Orders for the limited Caterham Seven SuperSprint have already started in Europe with prices starting at 29,995 GBP ($39,602). Judging from the similarly retro-inspired Seven Sprint which sold out within a week of its debut at last year’s Goodwood Revival, don’t expect it to be available for very long. 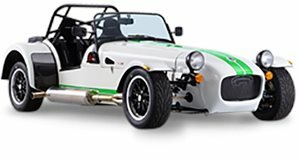 “The visual appeal of our new baby is only outclassed by a driving experience that puts you straight behind the goggles of Stirling Moss and Innes Ireland.” Orders for the limited Caterham Seven SuperSprint have already started in Europe with prices starting at $39,602. Judging from the similarly retro-inspired Seven Sprint which sold within a week of its debut at last year’s Goodwood Revival, don’t expect it to be available for very long.